Sharpen Your Playing Experience with Dunlop 412 Series Sharp Picks! 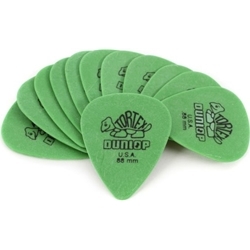 12 Green Sharp .88 Guitar Picks..
Dunlop offers Tortex Sharp point guitar picks for precision picking. Tortex gauges correspond to these millimeters/colors unless otherwise noted: .73-Yellow, .88-Green, 1.0-Blue, 1.14-Purple, 1.35-Black, 1.5-White.